There is much to be done regarding the inclusion of women in Africa. For a long time, the degradation of the feminine gender has profoundly marked cultures, communities and individuals – both men and women. But beyond the feminine condition and gender equality, the empowerment of women begins with a woman’s own perception of her capacities and her value on a human level. CONSA is concerned with this important issue, and reaches out to those who bring forth ideas and solutions. In August 2012, the “Action Volontaire de Bienfaisance” (AVB), a solidarity group comprised of 12 Cameroonian women, came into being in Yaoundé with the support of CONSA. Giving women a voice, coming together, encouraging self-expression, offering solutions for the good of the community and putting them in practice… this is the working spirit of the AVB. 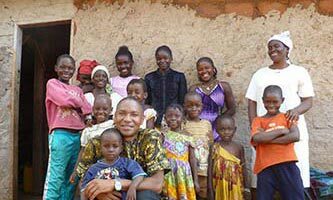 The AVB’s first project, as suggested by its founder Cécile Mbeza, was to sponsor an orphanage of 14 children from the ages of 3 to 17 in Mbankomo, a suburb of Yaoundé. Since September 2012, the women of the AVB have regularly helped Sister Angèle, the person responsible for the orphanage. They bring food and supplies, cook, work in the garden, and have fun with the children, much to everyone’s delight. 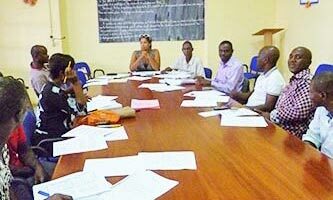 After giving many Teacher Training Courses in 2006, 2007 and 2008 in Cameroon and Congo-Brazza, CONSA has made two more Courses possible, one in Cameroon and the other in Ivory Coast, in 2012 and 2013. Students from 6 neighboring countries (Congo, Gabon, Benin, Togo, Chad and Burkina Faso) were also financed to participate. In total we have received, housed, and trained more than 75 participants in these two courses alone. CONSA works together with the International Gnostic Movement (MGI) to train new teachers in Ancient Wisdom, or GNOSIS. 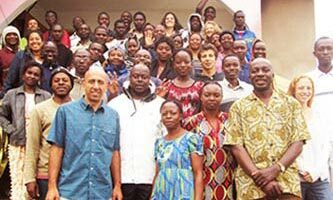 The participants have since returned to their country of origin where they now teach in Study Centers that CONSA and the MGI manage and support financially. In countries with low economic development, there usually exists an extensive knowledge of healing plants and the diseases they relieve, handed down from generation to generation. Samuel, Sylvie, Nicaise and Guilaine are four CONSA instructors who master this traditional knowledge, and who have a recognized expertise in local medicinal plants. 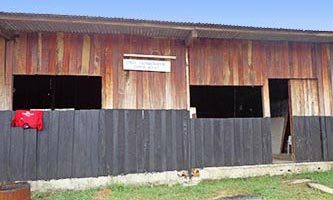 In Libreville, Gabon, they have set up a clinic where they administer moral support, natural remedies derived from ancestral knowledge, and health advice to the poor, sick and needy – all free of charge or at very low-cost. In collaboration with other instructors, CONSA facilitates the functioning of the clinic in Libreville, providing an alternative for the poorest of the community, who often cannot afford the costs of hospital services or required medical care. In addition, a literacy school is currently being organized in the same premises of the dispensary to meet an urgent need for local communities. Moringa is a small tree, very drought resistant and easy to grow in tropical environments. Consumption of the leaves, bark, roots or oil, has many beneficial properties to humans, and the plant is also effective in treating both land and water. It has been shown that Moringa can heal and cure hundreds of different types of diseases. It is often called the Miracle Tree. Various humanitarian organizations in Africa, India and South America are currently using the Moringa plant for many things like water purification and fighting malnutrition, together with the health problems that arise from it. In November 2012, following a proposal from Armel, a Congolese instructor then established in Abidjan, CONSA facilitated the creation of an educational project geared towards an all-boys orphanage in Bingerville, a suburb of the capital. CONSA’s instructors are currently working with 45 boys between the ages of 10 and 15 years on the cultivation of 2 Moringa crops. 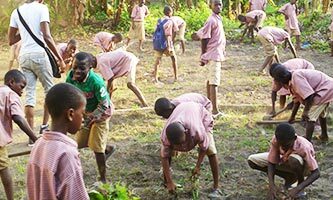 The children have been involved in all the stages of planting, from sowing to harvesting and transforming the plant’s leaves, as well as consuming the Moringa. The orphanage personnel, the nurses, the gardener, the educators and teachers, also collaborate and participate in the project. Ideas and projects for them, by them!